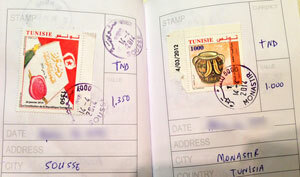 There are two trains from Sousse to Tozeur – 11:40 a.m. and 10:50 p.m. Having some time between breakfast and the 11:40 a.m. train, I checked out of the hotel and walked to the medina of Sousse to check out some souvenirs and also get the postal stamp at the local post office for my collection. Inspired by the places I have traveled to, I have designed a book that will keep a track of all the cities or towns I have been to, in a unique way. All I have to do is walk up to the local post office of every town or city I visit. Purchase a stamp, glue it in the book and request the post-master for the postal-stamp. Then add the date of stamp, address of the post office, currency (look for three character currency code at the back of the book), value and any other notes you would like to enter. It’s just my way of collecting memories. The train station, Gare de Sousse, was about 3-minute walk from the post office. And after a 5-hour train with multiple stops I reached Gafsa. This seems to be one of the main towns on way to Tozeur, but the only main attraction of Gafsa are the twin Roman pools at the southern end of Ave Habib Bourghiba, about 3.4 km north of the station. 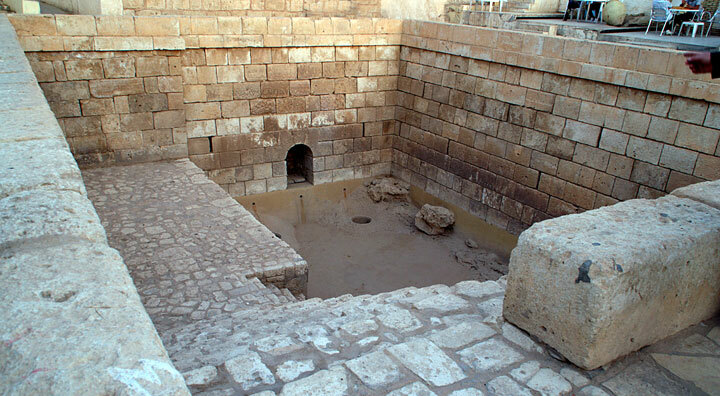 About five meters deep, these pools were built with large blocks of carved stone and sometimes are fed with water at about 30°C. They are especially known for the Latin inscription dedicated to Neptune and the Nymphs. When I reached there, they were dried up and honestly, it’s not worth visiting these! With disappointment up my sleeve, I walked back to the bus station less than half a kilometer away to take the louage for a 1 hour 30 minute drive to Tozeur. Note: I was hoping to take the Red Lizard train, but it doesn’t run at this time of the year. The Residence L’oued hotel, rated highly on TripAdvisor, was at the south of the town, but a 8-minute walk from the louage station (which is right next to the bus station in the center of the town). With great rooms, comfortable rooms and a fantastic pool in the central courtyard, this is an excellent option in the oasis town of Tozeur. Right off of the main street Ave Habib Bourguiba, you can see the palm trees from main gate or the poolside. The hotel has English-speaking and very helpful staff. Breakfast is served every morning in the restaurant. The two cons of the hotel are: 1) being right next to the palmarie, you can expect a lot of insects and mosquitoes. Make sure to have a repellent in your room. And 2) the entrance to the hotel is on a secluded, quiet street that may be uncomfortable to walk in the night. All in all, a great hotel worth the $37 a night. After a dip in the pool for a while, I headed out for a 5-minute walk to La Lune restaurant for dinner and back to the hotel for a relaxed night.